This dialog is displayed by the Form | Set Tab Order menu command, when a form is selected. It lists all the controls on a form according to their tab-position and allows, using the arrow buttons, reordering the tab-positions. Alternately you can simply click and drag control names to new positions in the list, which may be faster. 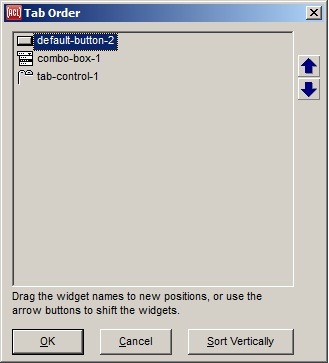 Pressing the Sort Vertically button will sort the controls so that they are ordered by the vertical position of the top of each control, with the control nearest the top of the dialog being first in the tab order. It may be most convenient to start with that order, and then to further adjust the order of individual controls as needed. The tab order of the controls is also the front-to-back occlusion order. This does not matter in the typical case where controls do not overlap, except that group-box and tab-control widgets need to be behind the controls that are on them. When designing dialogs interactively using form windows, this constraint is enforced automatically, but you may notice that group-boxes and tab-controls have mysteriously moved toward the bottom of the list in this dialog.